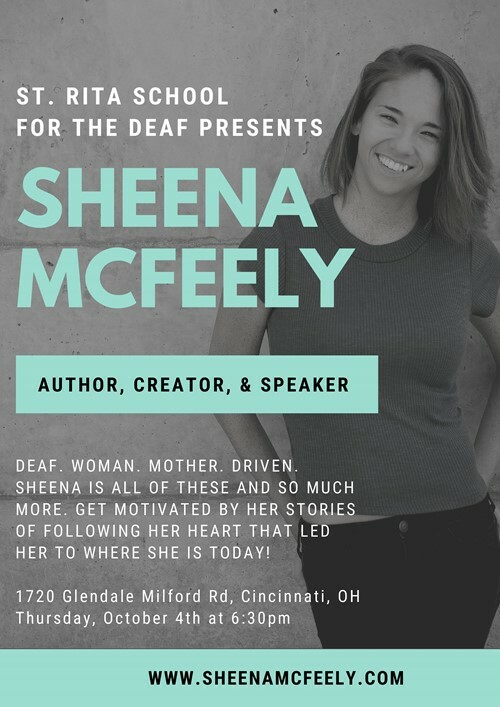 St. Rita School for the Deaf is hosting Sheena McFeely, the creator of ASL Nook, on October 4th at 6:30pm! Sheena is also a motivational speaker and will be sharing her life story with our community. Sheena McFeely was born in Hong Kong to an Irish father and Asian-European mother. Upon her parents’ discovery of Sheena’s profound hearing loss, America called their names. In California, Sheena attended an oral school learning how to speak and hear sounds. At the age of 10, her hearing parents realized that was not working at all. Sheena was then transferred to a Deaf program called TRIPOD where she learned American Sign language (ASL). Being Deaf, an immigrant straight out of Hong Kong, and small in stature did not stop Sheena McFeely from being who she is today. An author, a creator, motivational speaker, and momma. When she gave birth to a Deaf daughter Shaylee, she founded and hosted the first-ever awards ceremony “The Pearls” honoring Deaf women across America. When Sheena gave birth to her second daughter Ivy who is hearing, she created ASL Nook with her family in hopes to spread sign language to everyone. Five years and over fifty episodes later, ASL Nook has generated millions of views. Thanks to ASL Nook’s successes, Sheena’s family has been on The Nate Berkus Talk Show, in a viral sensation Disney commercial, and A&E’s TV pilot Deaf Out Loud. Sheena’s work also received acclaims from media such as Kickstarter, Austin Woman Magazine, UpWorthy, The Huffington Post, Mental_Floss, Deaf People, and Ability Magazine. Currently, Sheena shares her life story nationwide as a motivational speaker. This is all in the name of authentic representation, awareness, and equality of Deaf people.